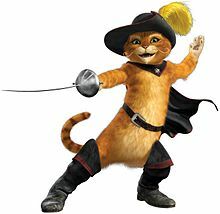 Fans of the "Shrek" series know that the addition of the Puss in Boots character in "Shrek 2" completed the lovably squabbling triumvirate of Shrek, the Donkey and Puss in Boots. 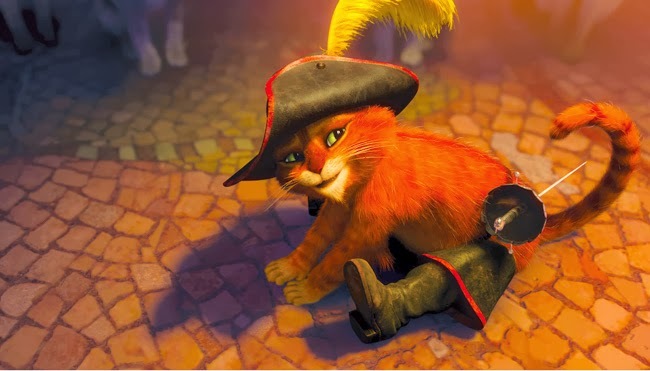 Puss In Boots has been a fan favorite since his first appearance in "Shrek 2," and many people all along wanted Puss to get his own movie. DreamWorks Animation listened, and here it is, "Puss in Boots" (2011). 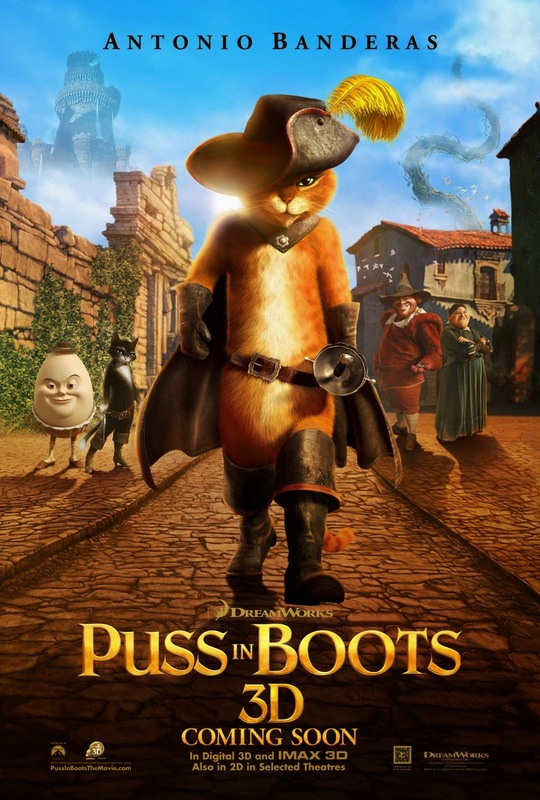 Though "Puss In Boots" originally was planned to be released direct to DVD, enough publicity was stirred up about "Puss In Boots" for the studio to release "Puss In Boots" theatrically instead. Was it worth the fans' wait? Most definitely. "I am at your service"
Puss in Boots (Antonio Banderas) is a talking cat who wears boots of "soft, Corinthian leather" (there is no such thing, but that's a direct homage to Ricardo Montalban's old car commercials). Puss in Boots is a suave bandit, running from the law and determined to clear his name. First things first, though: Puss In Boots finds out about a couple, Jack and Jill (Billy Bob Thornton and Amy Sedaris), who have magic beans that will get him into a castle full of treasure. Since Puss In Boots has been hunting the treasure for years, he becomes very interested. Puss In Boots tries to steal the beans, but is foiled by the unexpected appearance of Kitty Softpaws (Salma Hayek), a friend of Humpty Alexander Dumpty (Zach Galifianakis), who happens to be an old friend of Puss in Boots. Humpty and Kitty also want the treasure. Puss joins Humpty and Kitty and they steal the beans, planting them in the desert where they can grow to their full size. Puss, being a great lover, seduces Kitty, then they climb the beanstalk to the treasure castle. Rather than steal the eggs themselves, though, which are heavy, they kidnap the Golden Goose who lays them. Once they climb down the beanstalk, though, Jack and Jill surprise them and steal the goose. Puss chases Jack and Jill to his old home town, where he is captured by the police. The whole affair turned out to be a revenge plot by Humpty to get revenge for a childhood slight. In prison, Puss meets Jack from Jack and the Beanstalk, who tells him that the goose's mother - known as "The Great Terror" - will stop at nothing to get her child back. Kitty helps Puss break out of jail and takes him to see Humpty, who knows all about the Great Terror. After some discussion about what they all really want, they set a trap for it. They use the goose as bait, and a great battle ensues. Directed by Chris Miller, who previously directed "Shrek the Third," this follows in the tradition of the Shrek series despite the fact that Shrek and the others don't actually appear. The film has a lot of wit and charm, and it simply is a fun film with a dash of cat romance. These days, it seems as if everyone is adapting classic fairy tales for their own purposes (such as ABC's "Once Upon a Time" and Disney's "Maleficent"), and this is yet another take on those childhood stories. It may be a bit predictable, but we get Puss's famous "cute look," and Banderas is very smooth, like Puss's boots. Either you go for the "cool cat with insecurities" thing or you don't. Most audiences do. The 3D animation is great, but it really isn't needed. If you are looking for something that will knock your socks off with things flying out of the screen and sending you under your seat, this isn't it. If, on the other hand, you just want to re-visit an old friend and perhaps make a few new ones, this is a great chance to do that. Unlike "Shrek," this film seems to be set in a Spanish or Mexican desert and hits all sorts of stereotypical Latin archetypes. This gives it a much different feel and helps differentiate this from the "Shrek" series of films. It's a fun difference, you get the Latin swagger and braggadocio bereft of any "I don't need to show you no stinking badge" anger or pomposity. "I must avenge my honor!" 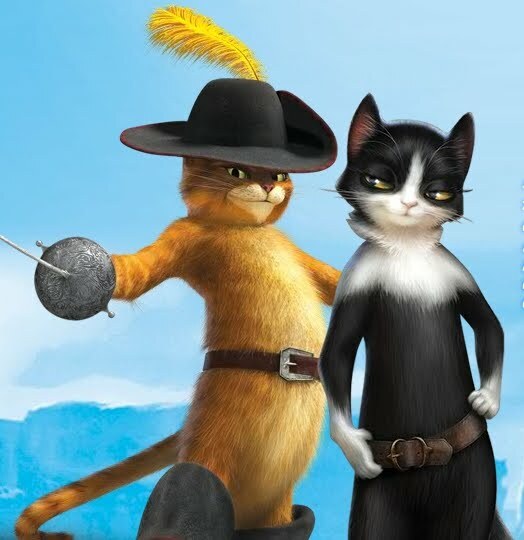 Films like "Puss in Boots" serve a real purpose in displaying the softer side of human differences, allowing us to revel in our diversity rather than fear it. They also play up the play up masculinity in general, while showing its human and loveable sides. 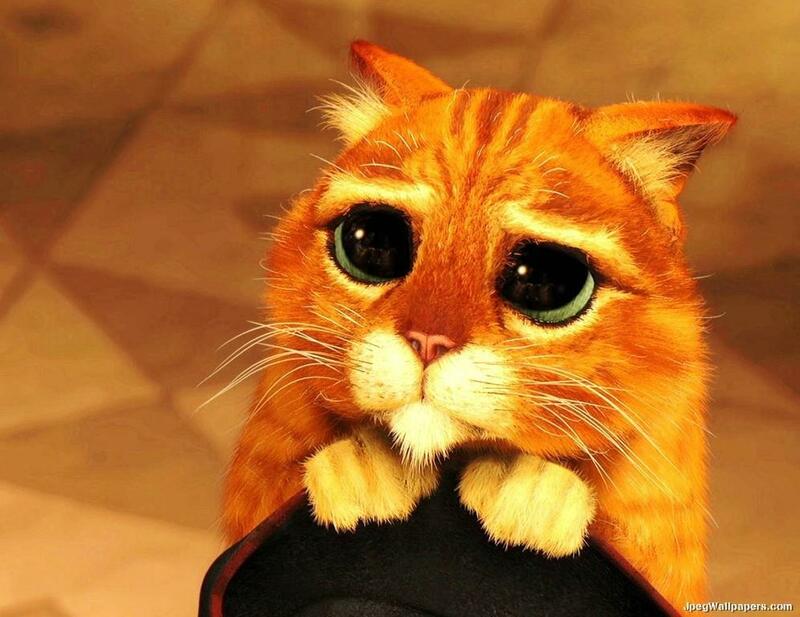 Puss has one of the most expressive faces in animation, displaying far more emotion than most human animated characters. This film sets the stage for further adventures, with a new triumvirate of Puss, Humpty Dumpty, and Kitty, but this film is sufficient by itself. 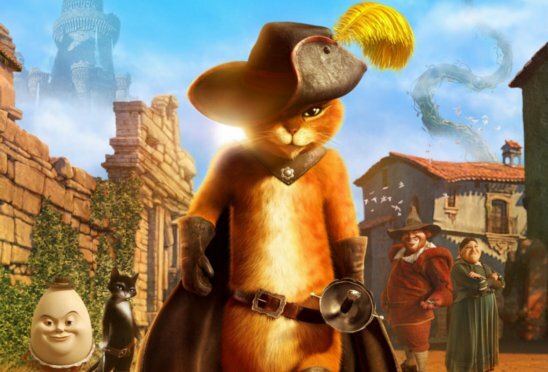 As of now, there are no plans for further films (though a short 13-minute "mini-movie," "Puss in Boots: The Three Diablos" was released in 2012). A sequel seems inevitable at some point, though, because "Puss in Boots" did a whole lot of business, especially overseas. Give it a few years, we'll see another one. "I must rest from my labors." Here's a cat who's both a lover and a fighter, and fans of "Shrek" should not be unhappy at all with this expansion of the character. It adds a whole new dimension to the DreamWorks "Shrek" universe. There are reports of a new "Shrek" film anyway, so we will see Puss in that. In addition, DreamWorks is expanding globally, with Shrek theme parks popping up in London, Shanghai, and elsewhere. I do wish they could have come up with a more original script for this film, but it is fun and witty and character-centered, and that works. Puss is probably my favorite animated character at the moment. 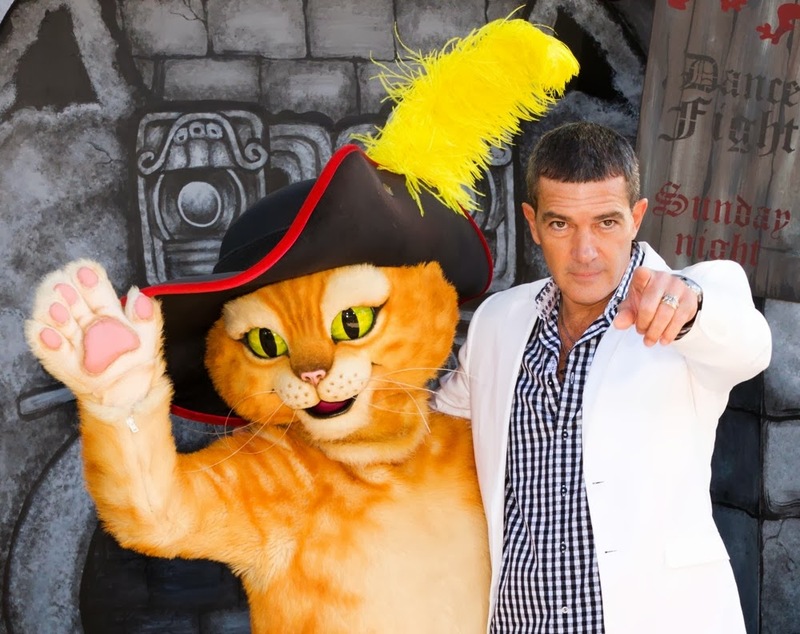 "I am Antonio Banderas and you are not." You may watch the entire short but excellent follow-up, "Puss In Boots: The Three Diablos" mini-movie, for free here if you wish. 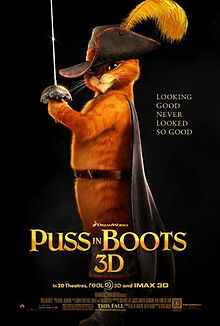 It's a nice little addition to "Puss in Boots" and will have to do until they produce a proper sequel. Also, depending on what time of year you are viewing this, you might like to receive Puss In Boot's personal seasonal holiday wishes. 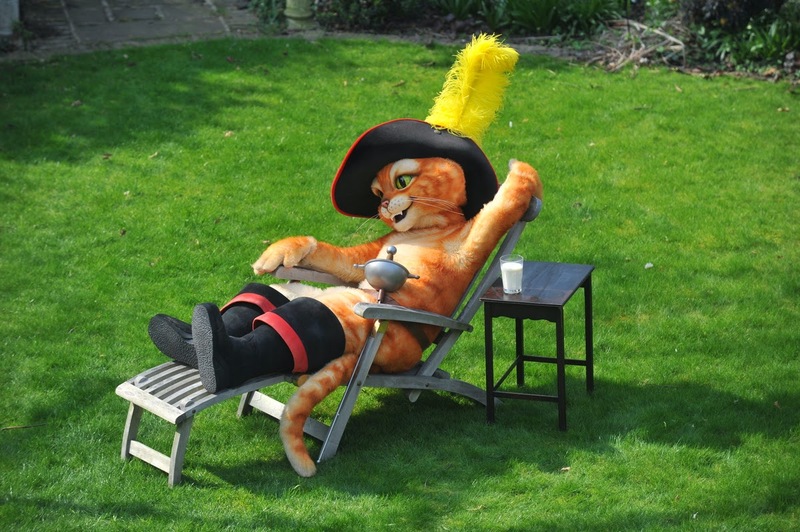 The Puss in Boots Old Spice tv spot is a classic, and the character has become so popular that there is a coming Netflix tv series devoted to him. All things considered, Puss in Boots has become a huge star in his own right, and the sky's the limit for this engaging feline. A sequel is tentatively scheduled for December 2018. Below, the official trailer.